If you are planning a vacation any time soon, check out this deal! This is my new favorite rewards card! Hyatt hotels are SO NICE and the rewards that you get by signing up for this card are CRAZY!! 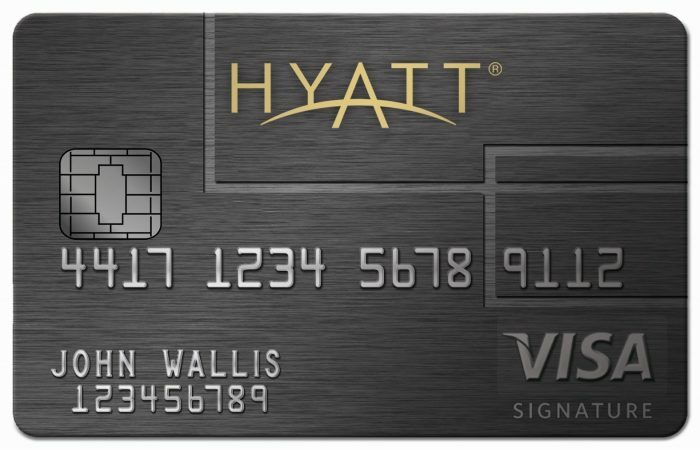 If you don’t already have a Hyatt Rewards Card, I highly recommend this card. If you sign up right now, you will get 25,000 bonus points after you spend $3,000 in the first 3 months. Plus, if you spend $6,000 in the first 6 months, you will earn an additional 25,000 points! (which will get you 3 more nights for free). We did this and we were able to get 6 nights for FREE at the hotel across from Universal Studios in Orlando with our bonus points! You will also receive one free night at any Category 1-4 Hyatt hotel or resort every year when your card renews! If you happen to spend $15,000 in a year, you will also earn another Free Night! Just a note, this card does have a yearly fee of $95.00, but the bonus points are totally worth it for me! Make sure you use your credit card responsibly and pay it off each month. What makes this card different than other points reward card? 1 – The Hyatt hotels are all categorized. These categories only change once in a while, and they give you notice before hand. Even if it is the “Busy Travel Season.” So, unlike other rewards that give you points that end up equaling dollars off, the Hyatt points will always be the same. Which means, if you want to travel to Disneyland, Universal Orlando, or even New York, the points that you will use on the hotel will stay the same! Even if you are traveling during PEAK TRAVEL SEASON!! 2 – Extra bonuses. You will get 2 free bottles of water for every day that you are staying at your hotel. You also get free late checkout! Which means you will always get 2:00pm checkout. You just have to let them know that you want to take advantage of this offer. 3 – Even more extras. They are adding extra bonuses all the time for card members. So keep checking your emails for updates once you get your card! Plus, Hyatt Hotels offer Free Breakfast! Our hotel across from Universal had a full breakfast buffet every morning included! It saves us so much money when we are traveling not to have to worry about breakfast! Here are a few examples of the awesome hotels where you can use your points! There are literally hundreds of hotels! These are just a few examples to show you why I love this rewards card so much! 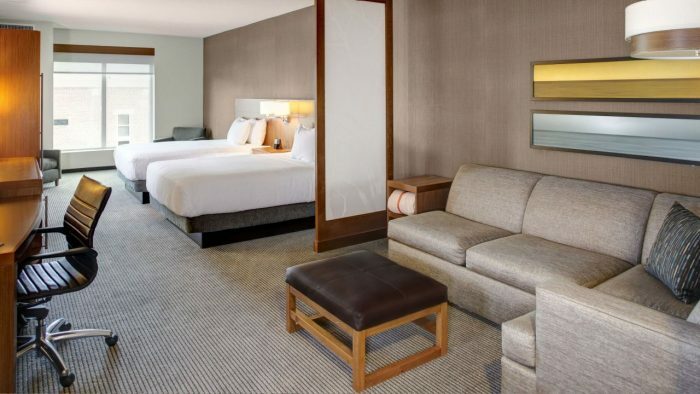 Hyatt House Anaheim has One Bedroom King Suites that you can get for just 8,000 points a night! That means that with this deal, you can get 6 Free Nights! This hotel is only 6 miles from Disneyland! The rooms are usually $179/night so you will save $1,074.00! 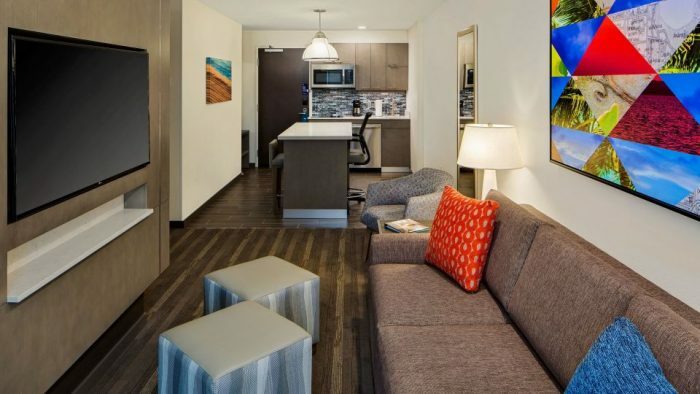 One-bedroom suite gives you plenty of privacy, plus ample space to work and relax. In addition to a separate bedroom with one king bed, separate bathroom, spacious closet and TV, this also offers a living area with a sofa sleeper as well as a kitchen. Hyatt Place Moab has a King Bed option or a Two Queen Beds! Both come with a sofa bed. Get these rooms for just 8,000 points a night! That means that with this deal, you can get 6 Free Nights! Moab is SO EXPENSIVE this deal is CRAZY! The rooms are usually $221/night so you will save $1,326.00! If you are like us and like to travel to Universal in Orlando, then check out this amazing hotel! 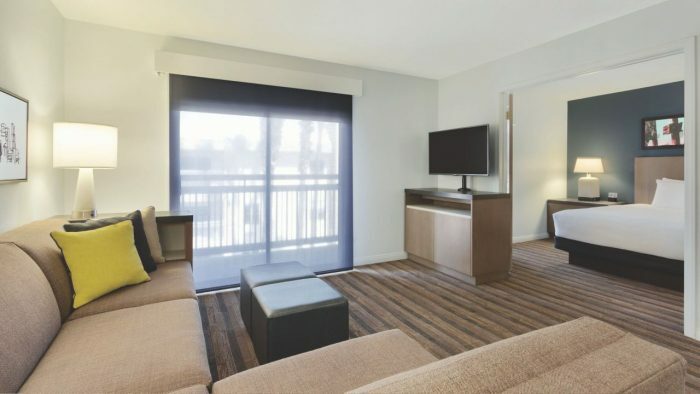 Hyatt House across from Universal Orlando Resort has a Studio Kitchen Suite with Two Queen Beds plus a sofa bed for only $8,000 points a night! That means that with this deal, you can get 6 Free Nights! The rooms are usually $149/night so you will save $894.00! It’s $95 a year, but you get a free night every year that you renew too.